Viewing topic "Sonar x3 & s70xs VST3 Editor"
In the case of the S70XS and a possibility for the Motif XF, here is a temporary workaround that I developed. 1. In Sonar Preferences>midi> Ensure that S70XS-4 port is NOT selected for either midi in or midi out. 6. In Sonar Preferences>Midi> ensure that the S70XS-1 port IS selected for both midi in and midi out. 7. In the S70XS synth track folder midi source track, select as Input “S70XS-1”, or alternatively your controller of choice. 8. 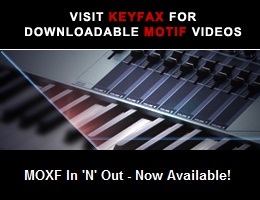 In the midi source track above, for output select “S70XS-1” and midi channel of choice. Do NOT direct midi source data to “S90 XS/ S70 XS VST -1” as that currently will not work. 9. For multi timbral use, insert additional midi tracks, put into synth folder and assign as #8 above but with channels 2, 3 etc as required. 10. Insert a stereo audio track, and include in the synth track folder. 12. After enabling arp out and assigning midi channel, this data will appear on the S70XS-1 port. If desired, include a midi track into the synth track folder for recording arp output. So, the above uses the VST Editor as solely an Editor, and Midi and audio data similar to an external synth. A screenshot of the synth folder with midi source, recorded arp and recorded audio is here.. The bottom line is that this achieves the objective of having the VST Editor embedded into a Sonar project for saving setups editing/changing voices and control, and streamlines the midi & audio data into the synth track folder for improved organization. Not sure if its a lot of use but documented here for completeness.. I hope this method also helps with the Motif XF also..
For the sake of comparison and to aid any fault finding, I downloaded the 30 day trial of Studio One to identify the behavior of the S70XS VST3 in that environment. The free version doesn’t support VST but the limited 30 day version demo did.. a bit of a challenge to get even the basics going and not a program I would adopt but I am sure it has its supporters. thanks again for all of your support on this topic so far..it is very much appreciated. Thanks for the helpful video, Mystic38! I spent several hours getting nowhere with my MOXF8 until I found your post. The same workaround works fine for me. Just wanted to weigh in here. The issues on the MOX8 are exactly the same. I had Studio One Version 2 and have switched over to Sonar X3. Both hosts claim full VST3 support. In both cases, I was able to use the editor VST inside the DAW, but only in a control aspect. Keyboard MIDI input was received by the VST (I could see the piano keys lighting up) but I was never able to get the VST to send and receive this data to the MOX and produce audio. The workaround for both DAWs was as you have described. . . Connect the VST editor for control, use it to configure the MOX, and then have separate MIDI channels for sending directly to the MOX and not through the VST. As a comparison, I had tried Cubase Elements 6 and in that case, the VST worked as intended. The VST editor behaved as a true VST instrument, sending and receiving the audio as well. I would like to echo the above issues the users are having with the VST3 in a non-Steinberg DAW. I have followed all instructions to the T. I am using the latest driver versions. My DAW has VST3 support. I am able to sync the VST3 to my Motif Rack fine. However… Port 1 remains “Not Assigned” and there are no options for it in the VST3’s drop down menu. THis clearly means that communication is established, however no MIDI is being sent to the rack and thus no sound is being triggered. My audio is routed just fine, b/c when I press the “audition” button, the sound comes through just fine. I have tried literally everything. I use Studio One v2, latest version. VST3 is supported.. I have several other VST3 products already.. the issue is not with Studio One. I’ve even tried using all available Yamaha Drivers, including DirectMusic, Emulated Direct Music, and legacy midi. (The DAW allows to switch between these). None work. Your VST3 Editor does NOT work with a non-Steinberg DAW. I have tried Studio One and Sonar x3. Both have free, full-featured demo’s for 30 days. Can you please confirm either yourself (or someone from the Yamaha/Steinberg development team) has tested the VST Editor in anything other than Cubase? This is absolutely unacceptable. Please don’t assume everyone here is doing something wrong (as customer support reps normally do). This is not the case here. There is something wrong with the VST Editor’s code, and it does not allow you to assign the driver to Port 1’s Midi Out. It’s deadly obvious. I am sending in a support ticket by the way.... and I hope this is taken seriously. Totally unacceptable. Can you PLEASE confirm you’ve downloaded a copy of Studio One or Sonar (again… both have FREE fully functional demo’s with VST3 support)… or even Savihost.... and PLEASE confirm if you’re able to duplicate this issue. I had read through perhaps 4-5 threads that report the exact same issue but I have seen zero attempts from you to actually test it for yourself with another DAW that supports VST3. All is see if you referring back to Cubase, or trying to troubleshoot settings. Unfortunately, that’s not helpful here. We need you to see for yourself exactly what we’re talking about so perhaps you can relay the message. I’m having exactly the same problem running the Editor as a VSTi in Sonar x3 Producer. I use my XS8 as a FW audio interface and I set it up to handle MIDI via FW, as well. The VST3 version of the Editor receives MIDI signals from a dedicated MIDI track, synchronizes with the XS, and allows you to change settings (patches etc) from within Sonar, but does not produce any sound; the only option available in “MIDI Out” is “Not Assigned”. The workaround described in this thread doesn’t work for me, either, as I get a lot of stuck notes, while some are omitted (no audible response to a keystroke). I’ve experimented with the standalone version a little bit, and couldn’t get any sound out of it at first, as well. Then I noticed a feature that isn’t present in the VSTi version - namely, a MIDI Thru button on the right-hand side of the virtual keyboard. As soon as I enabled it, everything worked just fine. Any help will be greatly appreciated! Sonar’s Insert > Soft Synth > VST3 function reveals three versions of MOTIF XS VST (or maybe the same VSTi listed in three different categories): DSPBased, External, OnlyRT. No matter which one you choose, there’s no VST Setup option in the Editor’s File menu. The difference between Cubase and the other DAWs is that no virtual audio is passed from the Editor to the DAW (in Cubase, the VST Editor works just like a soft-synth real-time generating audio from MIDI input which is convenient (or “elegant") but also takes up a lot of CPU-resources). That’s why you cannot set up an Instrument track with the Editor VST in Sonar X3 (well, you CAN but you can’t hear/mix/record anything). So there is no real-time MIDI-to-audio conversion like in Cubase. You can only record whatever comes out of the MOX’s audio outs directly to audio tracks and then use Sonar’s audio mixing tools on that. I guess whether that’s “unacceptable” or not depends on your workflow.